Get logical. Motherhood doesn't complete a woman. Nothing does. Because you know what, a woman is not incomplete to begin with. She is born complete. She is complete because she exists. Because she was born a full human and is not waiting to be completed by a man, marriage or motherhood. These are mere personal choices a woman makes. All images are placed on separate layers for easy editing. The popular Facebook page 'Logical Indian' posted a series of sketches, by a Nordic artist by the ID @ab.bel on Instagram, depicting the hard work that motherhood is, the plight of a mother trying to feed, bathe, cook, clean for a baby. This is an open letter to them in response. Get logical. Motherhood doesn't complete a woman. Nothing does. Because you know what, a woman is not incomplete to begin with. She is born complete. She is complete because she exists. Because she was born a full human and is not waiting to be completed by a man, marriage or motherhood. These are mere personal choices a woman makes. They neither define her nor complete her. Hard for you to understand I know, because according to your understanding a man is the default position, woman is the odd variation. Man is the general, universal, woman is the other. It is little surprise that the most famous tagline for a men's clothing brand goes, "the complete man" not "a complete man." It is not like a certain man becomes complete in a certain way. The human male is complete by default. But a female needs motherhood to be complete. No. Not logical. Please apply a bit of logic and understand that women are born as complete and equal human being as men. Am I repeating myself? That's because until you understand this, you will never understand why women demand equal human rights. Before posting these sketches, why didn't it occur to you that the woman is struggling alone with the baby in most? Where is the father? And when we are at it, what completes a man, may I ask? What about fatherhood? Why don't we have similar common tropes telling a man you were born incomplete until so and so happens? You only become complete when you become a father. That no matter how difficult it gets to bathe and feed a child, you bear it because THAT is your greatest reward and your greatest purpose. Why don't we have popular culture, literature, art, filled with such motifs binding a man to domesticity and housework by glorifying his duties as husband and father? Before posting these sketches, as lovely as they are, why didn't it occur to you that the woman is struggling alone with the baby in most? Where is the father? Out of the 16 images, the father is seen in only two, sleeping in both. The mother is breastfeeding, cooking, playing, doing grocery shopping, watching TV, trying to attend a phone call--she is always alone, apart from the baby. If the mother can do all these tasks alone, why should she marry at all? Why don't we accept single mothers with open arms, sans judgement? You would probably argue about independent choice in a free modern society. Please understand 'free choice' doesn't exist out of context and without conditioning. There are no free lunches remember. Our choices are conditioned by societal standards, expectations, definitions of good woman, bad woman. Tomorrow if a man shames a woman... and tells her that she is less of a woman unless she is a mother, you might be just a little responsible. You quoted Robert Browning in the post. He must have said those words--"Motherhood: All love begins and ends there"-- sometime before 1889 (the year he died). And we are still using his words to reinforce the same idea. Such words and motifs put the pressure on women to perform in a certain way and that's when their individual choices get influenced by social expectations. Choice is a slippery slope. Your page has a following of more than 49 lakh people. Any medium with that kind of mass outreach should really be a bit more logical and responsible. Read up, learn about issues, because you are influencing a lot of young minds here. Tomorrow if a man shames a woman for being ambitious, for putting her career over motherhood, and tells her that she is less of a woman, incomplete and inconsequential unless she is a mother, you, Logical Indian, might be just a little responsible. A complete 40 something, independent, single non-mother woman. PS. The artist says "feel free to repost" but I am still concerned about your use of her work. 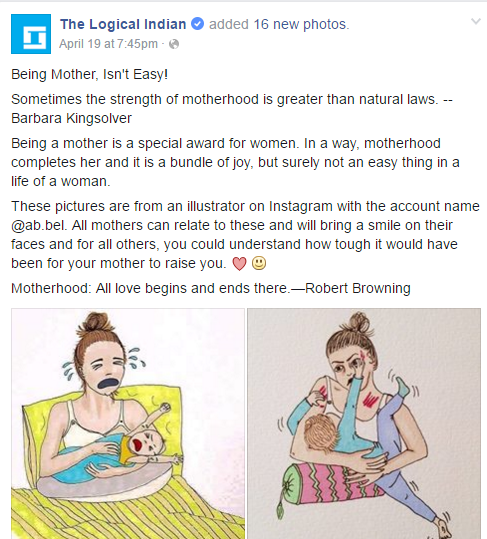 Her original posts do not utter a word about motherhood, so how did you deduce that message? This is misappropriation of her work unless you are sure she is comfortable with the message you randomly deduced. So question is, have you communicated with the artist? Have you taken her permission before reproducing her work?